For those of you waiting for your review of Apple's latest incarnation of its AirPort Extreme wireless router, your wait is over. The testing is done, the charts compiled and the product boxed up and put on the shelf to await a future giveaway. If you were expecting Apple to blow away the competition with its first AC1750 class draft 802.11ac router, you may be disappointed. At least by my testing, it didn't. Since Apple doesn't name its products so that you can easily tell them apart, we're left to our own devices. iFixit refers to the product as the A1512, which is its model number. Others may use its ME918LL/A part number. 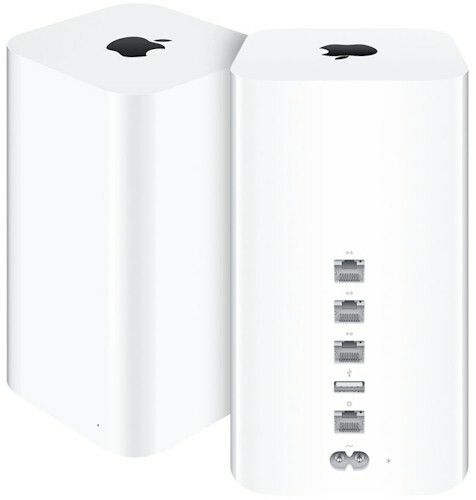 Me, I'm going to be more descriptive and call it the AirPort Extreme AC, or AExAC for the rest of this review. As usual, Apple has done a magnificent job with the AExAC's physical design. The tower design puts the six-antenna array up top, for both height and to give each antenna an unobstructed path. As you peruse iFixit's excellent teardown, you can't help but admit that the design borders on a work of art. The board detail photo is below, with its callouts, for your convenience. I've compiled the key components into the table below. Since the AExAC uses a second-generation Broadcom SoC, I've included the only other AC1750 router with a second-gen Broadcom CPU that I've tested so far—D-Link's DIR-868L—for comparison. There is no specific information on the BCM53019 CPU to be found. But the numbering would indicate that it is a member of Broadcom's StrataGX communication processor line. The BCM53017 and BCM53018 are described as dual Cortex-A9 CPU up to 1.1 GHz, 512 KB L2 cache (including ECC), 16-bit DDR2 interface, USB3, integrated switch, GPHYs and packet accelerator. So it's a safe assumption that the 019 has at least that much. The specs for the BCM4708 are similar, but a bit less beefy, i.e. dual Cortex-A9 CPU @ 1 GHz, 256 KB L2 cache, Gigabit switch and PHYs and USB 3.0. The AExAC is the first AC1750 router I've seen to use two BCM4360s. This 3x3 802.11ac transceiver has been the standard 5 GHz radio in all Broadcom-based AC1750 and AC1600 class routers to date. But since it also handles 3x3 802.11n, it's perfectly suited to use as the 2.4 GHz radio. Taking this approach will let Apple keep its options open to moving the AExAC up to an AC1900 class router like ASUS' upcoming RT-AC68U. I used Apple's AirPort Uility for Windows (version 5.6.1) with a Win 7 SP1 system to configure the AExAC. I've stated in previous reviews that I'm neither a fan of Apple's approach nor the utility itself, so I won't belabor the point. If your routing needs are simple, the AExAC will probably do you just fine. But it could leave some buyers in the lurch due to what it doesn't support. I didn't notice any new features and here's the summary of Apple's standard router feature set copied from the Gen 5 review. I didn't copy over the missing feature list from the Gen 5 review, but it remains the same. The key omissions are the lack of support for 40 MHz bandwidth in the 2.4 GHz band, guest network in 2.4 GHz only, no UPnP support and no WiFi Protected Setup (WPS) support. For advanced features, you won't find anything in the way of parental controls, web filtering or bandwidth management / QoS. The router comes defaulted to the same SSID for both bands, but you can set a different one for 5 GHz.